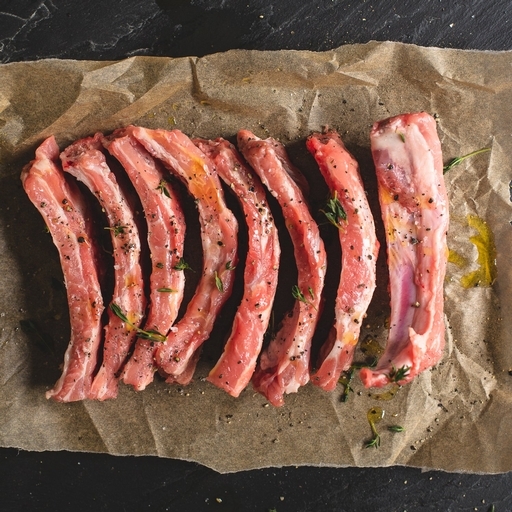 Fresh organic pork riblets – messy, fun and tasty. A winner on the barbecue, but also oven-cooked, until the meat is so tender it falls off the bone. Good with salty-sweet Asian flavours like hoisin, honey and soy sauce. They’re easiest to eat if you abandon your cutlery and use your hands! Serves 2. You can cook these directly on the BBQ for 20 mins, generously seasoned or marinated. You’ll get nice crispy edges, but the meat will be a little chewy. They are best slow cooked in a covered roasting tray with a dash of water at 160˚C/Gas 3 for 2½ hours, until tender. Cover with your BBQ sauce of choice and finish on a medium BBQ for 20 -30 mins, turning and basting often. Alternatively, finish uncovered in the oven, turning often, for 30 mins at 200˚C/Gas 6. The meat will be almost ready to fall from the bone.